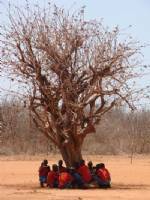 "The Trusts for African Schools (TAS) model is a unique and effective way of supporting remote schools in Kenya. An excellent example is what Gill and her team are doing in my own constituency by involving local business and professional people in the local trusts thereby improving transparency as well as capacity building". TAS (Trusts for African Schools) was set up to support some of the poorest schools in Africa. Transparent, sustainable school improvement is our aim. Access to education is no longer the main problem for Africa's children - it's the quality of that education that is holding them back. The mechanism we employ is to establish a series of local trusts with each one sitting alongside a particular school. Each of these trusts is dedicated to supporting a local school and is legally constituted with Trustees from the school, the local community and further afield. All include some business /professional people. Once established, the local trusts work out their priorities for funding, get tenders and quotes where appropriate and complete our simple proposal form. This is sent to TAS and trustees in the UK consider the application. If agreed TAS allocates the funds and transfers them direct into the local trust’s bank account. Local trustees are responsible for spending 100% of the money on priorities agreed with the school. Trustees are not paid anything. We believe this structure ensures accountability and transparency while at the same time building capacity at local level. We now have 15 school trusts established (supporting over 6000 children at any one time), all in very poor areas. The groups meet when they can and.establish priorities for funding which are put on the website. We aim to support schools for a period of around 6 years to get them up to a good standard of infrastructure. After that we wind down the TAS funding although we do keep in touch with the schools and support them with small projects. The hope is that the trusts will continue to operate and raise funds from local and other sources. We are keen to work with local groups and agencies on a co-funding basis. We have established an exciting partnership with the Kenya Wildlife Service to support 11 of the school trusts in the very poor and arid region around Kora National Park. High quality trustees have come forward to lead these groups and the local communities are strongly motivated to improve their school.